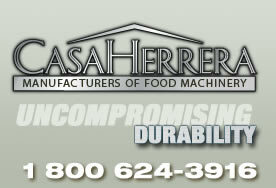 Casa Herrera has developed the perfect combination for the production of Corn Tortilla and Tortilla Chip. 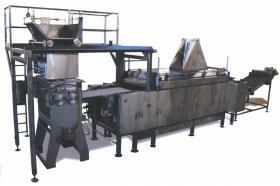 The Pre-Sheeter, Sheeter and Odyssey Oven system allows the continuous product flow from masa to tortillas. The pre-sheeter extruder will not stress or over work the masa, feeding a consistent ribbon of masa to the sheeter rollers. The differential speed sheeter head sheets the masa at the desired thickness, it works great even with very thin product. 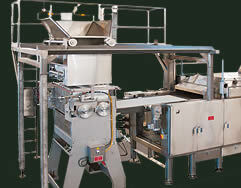 The oven infeed conveyor is mounted on the oven and has an independent drive and a tilt feature that allows for ease of maintenance and sanitation. The patented Odyssey oven is the most efficient tortilla and chip oven in the industry, with premix combustion, longitudinal burners with indpendent flame controls. It allows a softer product and better consistency. Controls options include Relay Logic or programmable PLC touch screen. 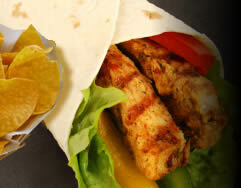 1,000 to 8,000 Dz/H Corn Tortillas. 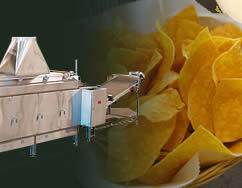 1,000 to 4,500 Lbs/H Tortilla Chips.